So you’ve got Karma piling up in your wallet but you’re short on gold, what do you do? Well you can definitely squeeze some gold out of that Karma if you’re willing to go through a few steps to get there. Before you do anything though, you may want to ask yourself if there’s a better use for all of that Karma. Karma can be used to purchase cultural weapons, cooking ingredients, and even exotic armor. But most of all, crafting Legendary weapons requires a large sum of Karma, and we’re talking north of 1,000,000 Karma. So don’t go trading all of your Karma away just yet if you’re at all thinking about crafting a Legendary weapon in the future. 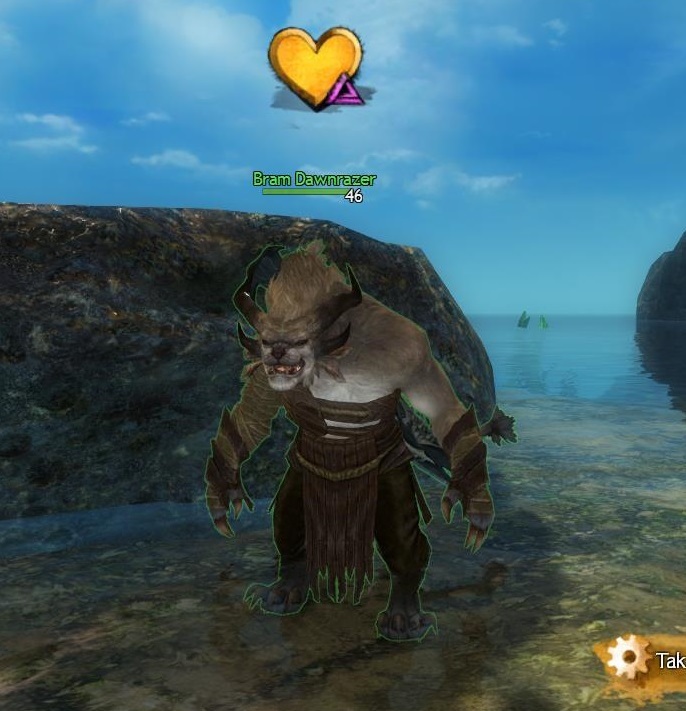 That said, here are some of the best methods for converting Karma to Gold in Guild Wars 2. The values below are meant to provide a benchmark and may vary significantly in your experience. 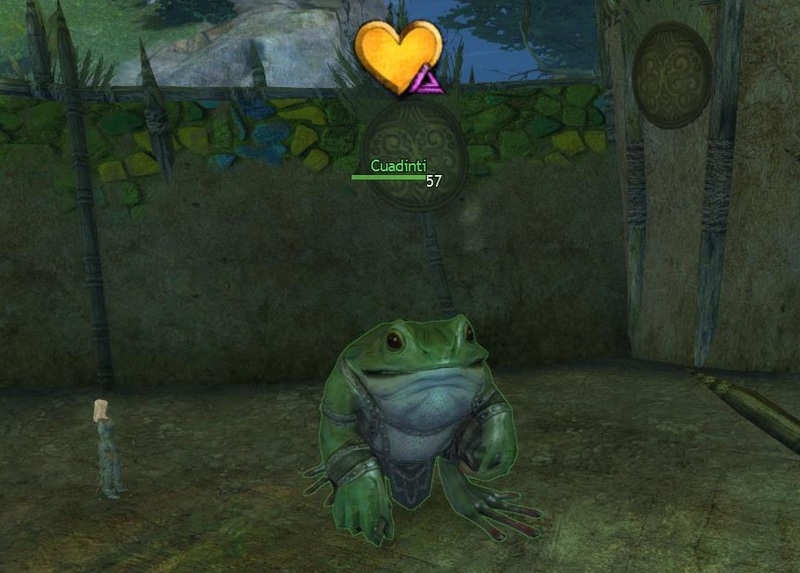 This method involves using Karma to purchase “Cloth Crab Grabbin’ Gloves” in sets of four, which are then thrown into the Mystic Forge in order to receive a light armor item that can be salvaged for Linen and Wool. As you may know, Linen and Wool are two of the most valuable salvage items in the game. These materials can then be sold on the trading post. This method is the most reliable because it provides a predictable amount of decent profit. 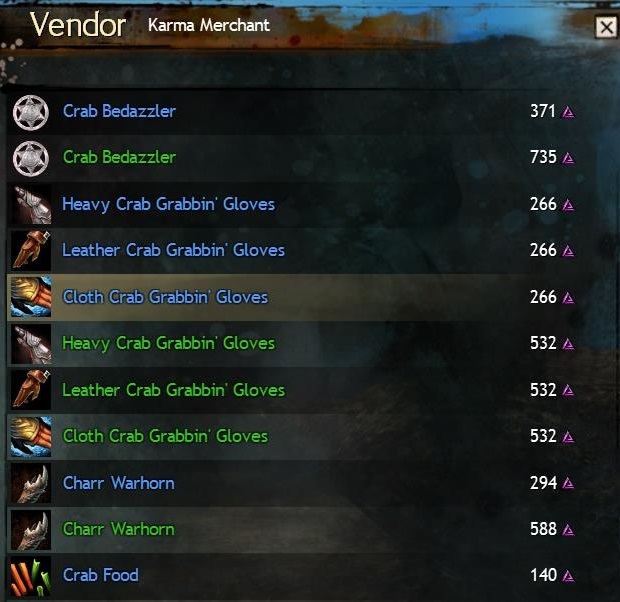 I purchased 40 “Cloth Crab Grabbin’ Gloves” for 10,640 Karma. After combining them in the Mystic Forge I received 10 light armor items. I salvaged those items and was left with 13 Linen scraps and 4 Wool scraps (plus 11 luck). *Note: The picture below should show 13 Linen instead of 11. Total profit after fees was ~70.1 silver. So the 10,640 Karma I spent resulted in just over 70 silver. This method is by far the fastest method for converting Karma into gold, but the trade off is that you receive much less gold. 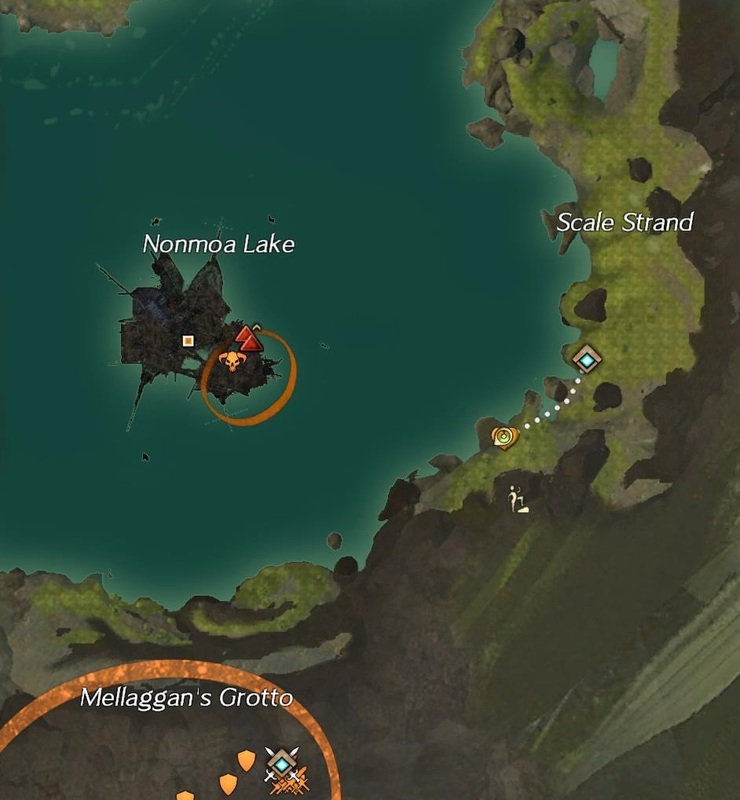 All you have to do is purchase a “Lost Orrian Jewellery Box” from one of the many Karma Vendors in Orr and then sell off the proceeds. 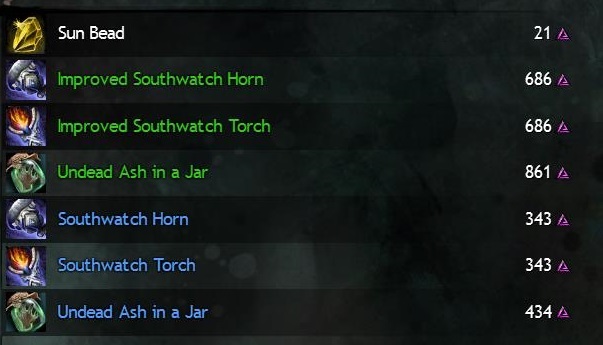 You can even sell the junk items right back to the same Karma Vendor. What’s interesting about this method is that you receive consumable Karma as loot from opening the box, which reduces the overall cost. 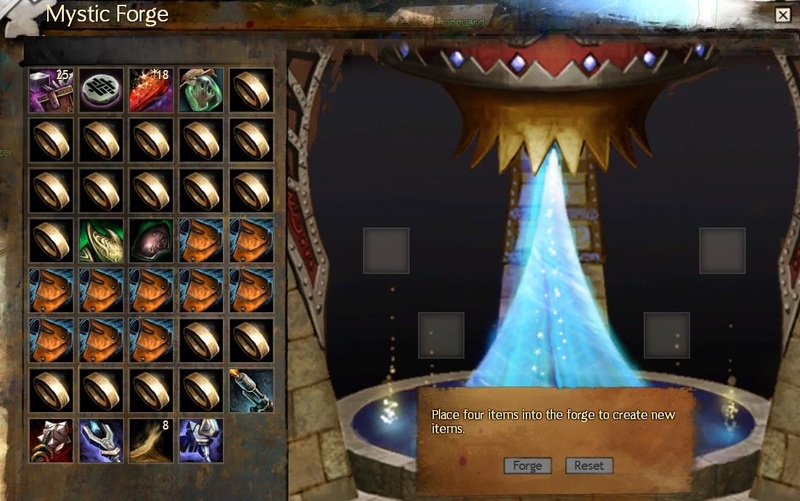 Most of the time you will receive junk unidentified objects, but there is a small chance for more valuable loot such as lodestones. 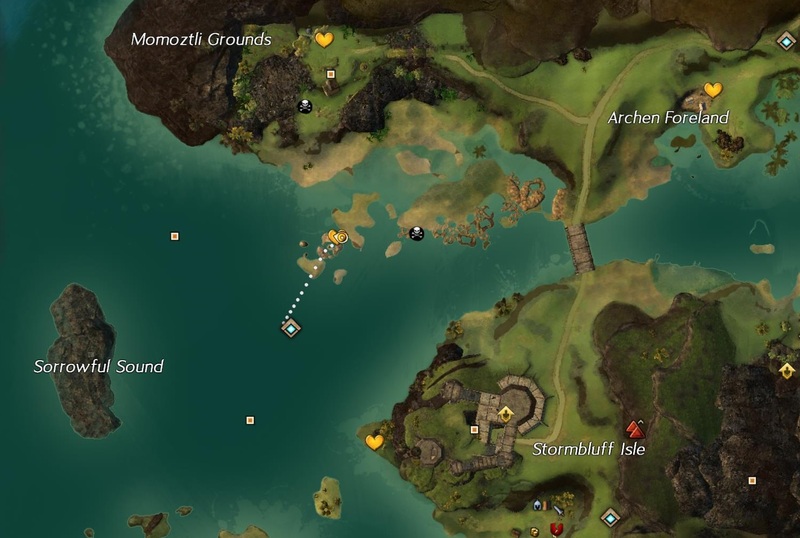 This method should be your last resort and only used if you’re seriously desperate for quick gold. I initially purchased 4 boxes for 18,200 Karma and received the following loot. The unidentified objects are worth half a silver each, totalling 13 silver, in addition to 12,250 Karma. I then reinvested this Karma by purchasing 3 more boxes. The total Karma spent for 7 boxes was 31,850 and the net proceeds consisted of: 17,750 Karma, 31 unidentified objects worth 15.5 silver and a single obsidian shard. Factoring in the Karma gained from loot, the net cost was 14,100 Karma and the net profit was 15.5 silver. Beaded Weapons are crafted using 2 standard weapon components (e.g. blade + hilt) and 75 Sun Beads which are purchased with Karma. If you have the patience, this method will yield the highest gold to Karma ratio because Beaded weapons fetch a relatively high price on the trading post. The key to making it work is to craft weapons that offer the highest profit margin, meaning that the sell price minus the cost to craft is favorable. 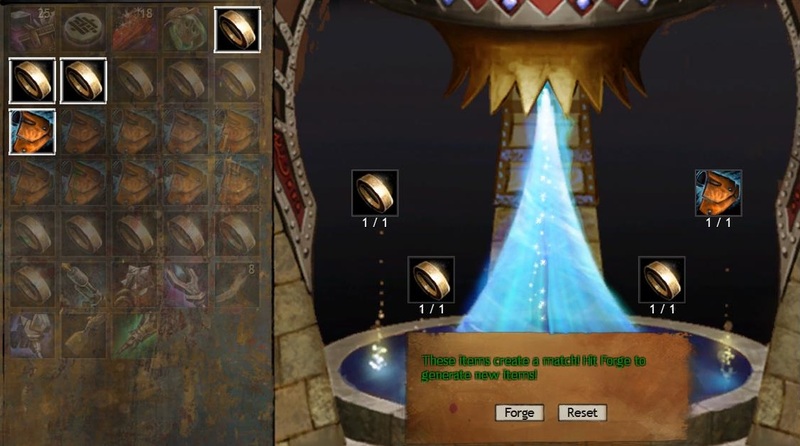 Although this method can provide a high level of gold, it is very time consuming and does not scale very well. 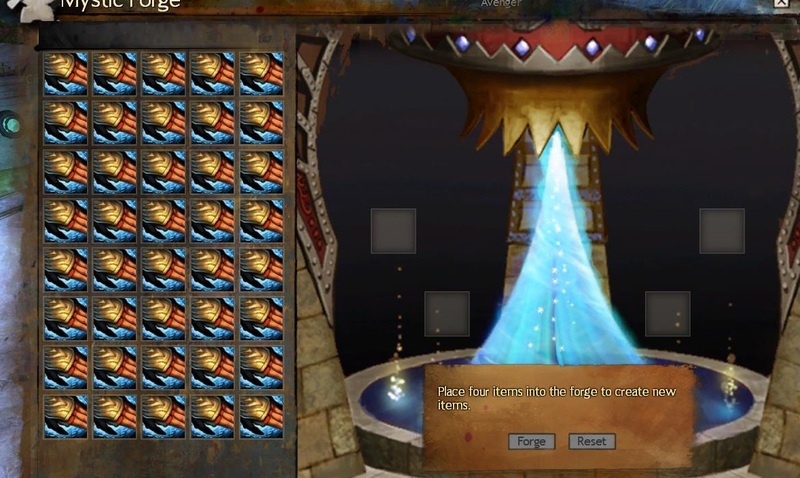 Simply clicking to purchase each of the 75 Sun Beads can get tiring. First I purchased the required 75 Sun Beads for 1,575 Karma. In deciding which weapon to craft I found that, at the time, the Beaded Focus was the most profitable. So I purchased 5 Hard Wood Planks for 24.3 silver and crafted a Hard Focus Core and Casing. I then combined all three items on the crafting discovery tab to create the weapon. My total cost to craft the focus was 1,575 Karma + 24.3 silver. I sold the focus on the trading post a few minutes later for over 99 silver, which came to 84.9 silver after fees. Subtracting materials costs we are left with a net profit of 60.6 silver having only spent 1,575 Karma. 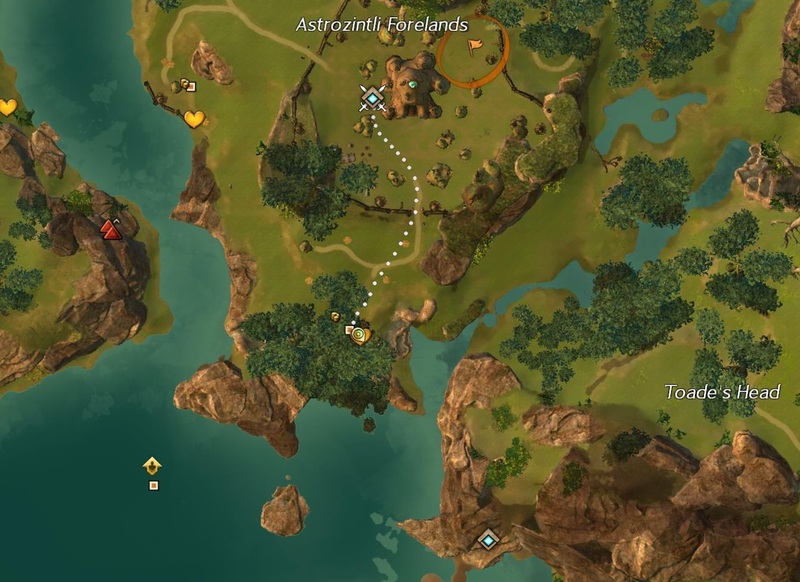 The goal of this method is to obtain exotic items from the Mystic Forge by combining 3 Commander’s Rings (rare), that can be purchased for Karma, with a 4th rare-quality item that is purchased separately. The recommended 4th item is a >60 level rare armor piece purchased for as cheap as possible. The reason for having this 4th item instead of just forging 4 Commander’s Rings is to increase the chance for an exotic item drop because the rings are not high level rare items. Risk comes into play because most of the items you get back out of the forge will not be exotic. It takes a consistent level of exotic drops for this method to be worthwhile and should not be attempted in small batches (unless you just love the thrill of gambling). I purchased 36 Commander’s Rings for 53,424 Karma and 12 rare armor pieces, at an average cost of 16.7 silver each, in order to complete 12 even forges. Each time I combined 3 Commander’s Rings with 1 of the rare armor pieces. The final result left me with 10 rare and 2 exotic items. The total revenue from selling all of these items on the trading post was a little over 7.6 gold. Most of this came from just one of the exotics which sold for over 3 gold on its own. 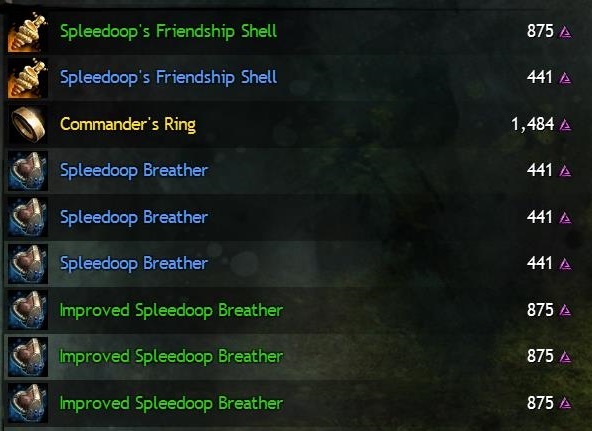 Subtracting trading post fees brings the total down to ~6.5 gold. Then after subtracting the cost of the 12 rare items, which cost a total of 2.1 gold, the net profit becomes ~4.5 gold. So spending 53,424 Karma resulted in ~4.5 gold. Not too bad, but things could have gone South quickly in the event of an exotic item drought. Converting Karma to gold isn’t as simple as it sounds. Getting the most gold for your Karma takes some real effort. 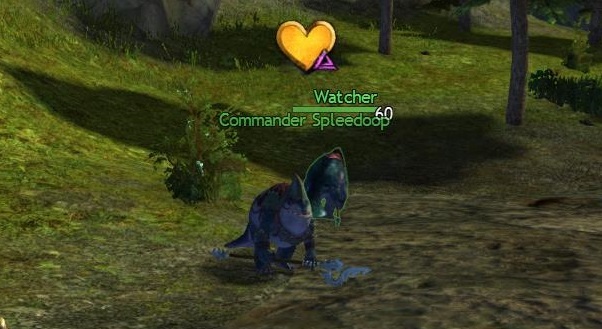 Gold aside, the best way for you to spend Karma is whatever way helps you get maximum enjoyment out of playing the game. December 2016, I’m averaging 1g per ~10k karma using the crab gloves.